Another line on the picture came out from the bottom right hand side of the door of the Ka’bah, and this was labelled as Musalla Gibril. 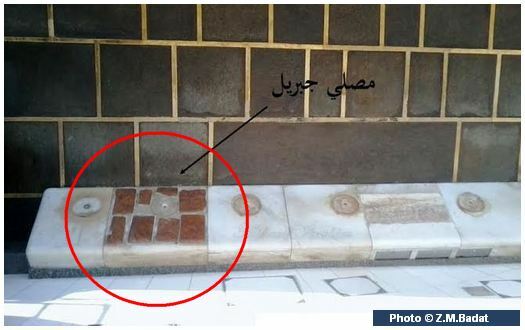 This area is marked by some brown bricks on the white tiles and is known as the area in which Gibril (peace be upon him) taught the Prophet (peace be upon him) how to perform the five daily prayers that were prescribed during the Mi’raj. Gibril (peace be upon him) came to the Prophet (peace be upon him) on two consecutive days to teach him the Salahs. On the first day he came at the beginning time of the prayer and on the second day he came at the end time of the prayer to teach the Prophet (peace be upon him) and his companions (may Allah be pleased with them) the timings of each prayer and also how to perform each prayer.